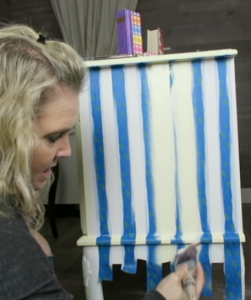 Paint your base color on your piece. You will want to have your base color completely applied (the number of coats needed for full coverage ). You want to make sure you have enough coats on, so you don’t have to go back and touch up any areas after you’ve done your stripes. 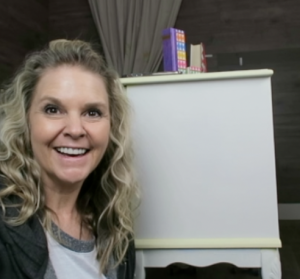 On this project, I used Dixie Belle’s Fluff as my base coat color. 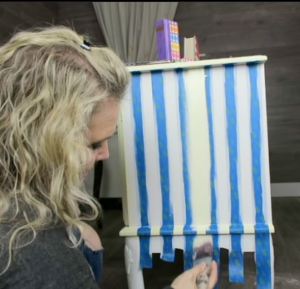 Decide what sized stripes you want on your piece and how much space between stripes you want. I prefer to use “ ScotchBlue .94″ for delicate surfaces” . 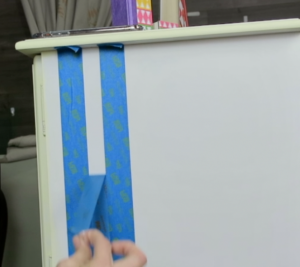 Place your 3 strips of tape on your surface (one right next to the other). 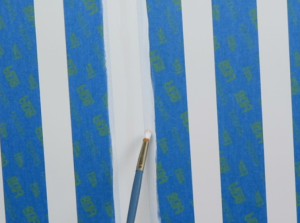 This is an easy way to keep your stripes straight. 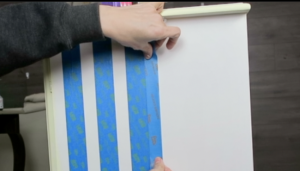 Then pull up the second piece of tape (the one in the middle) and move it to the other side of your 3rd strip of tape (this piece of tape we just moved will be what we use as a “spacer strip” to keep moving to make sure our stripes are evenly distributed down our surface. 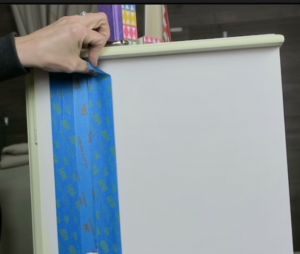 Place another piece of tape right next to the “spacer strip” that we just moved….. then pull up the “spacer strip” and moved to the other side of the strip of tape we just put down. See what I’m doing here? 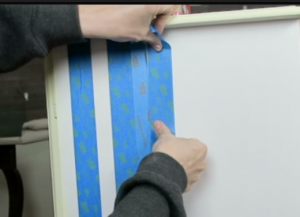 I’m just putting take down, place the spacer strip, then put another piece of tape down, pull up the spacer strip and move it to the other side of the tape we just put down…… our stripes will be straight / evenly space/ and looking so professionally done. Now that we have our taped stripes down, we need to seal the edges of the tape so we don’t have that “ paint bleeding under the tape” look. You have a couple options for this : 1.) 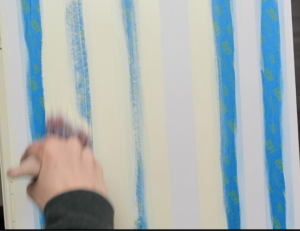 Use your base coat color and apply that color paint in one thin coat down the edges of the tape or 2.) 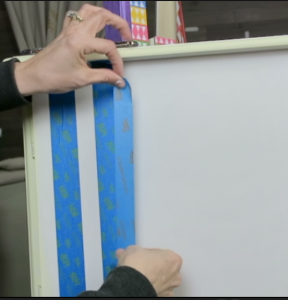 Use a clear coat sealer and apply a thin coat down the edges of the tape. Both work great, its just a matter of preference… some people prefer one over the other, but I find they both work. 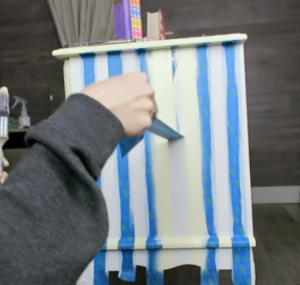 Let the paint dry that you just painted on the tape edges. 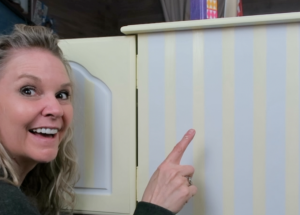 Paint your stripes !! I”m using a solft yellow from Dixie Belle called “Lemonade” . 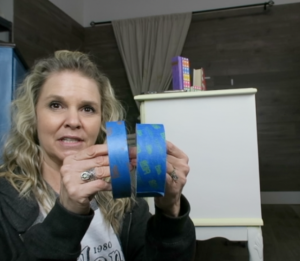 Make sure to remove your tape when your paint is still wet …..if you let the paint dry it may pull up the base color you just painted on the tape edges.